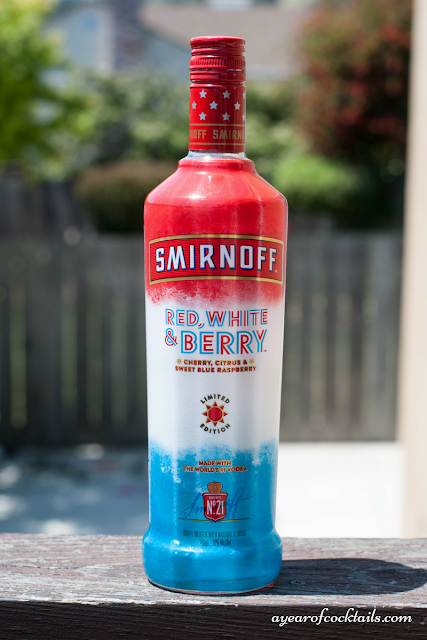 I was sent a bottle of Smirnoff Red, White & Berry to try. I was not paid for this post. I am here to tell you what I think about it and the awesome cocktail I made with it. All views and opinions are mine. Ready or not, Memorial Day weekend is coming full steam ahead! But don't worry! I made a brand new cocktail in celebration! 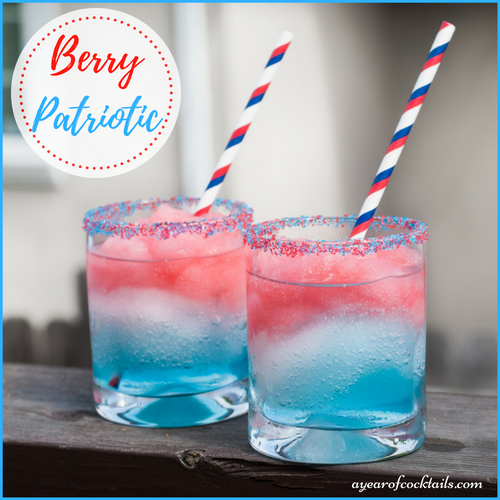 I call it Berry Patriotic! 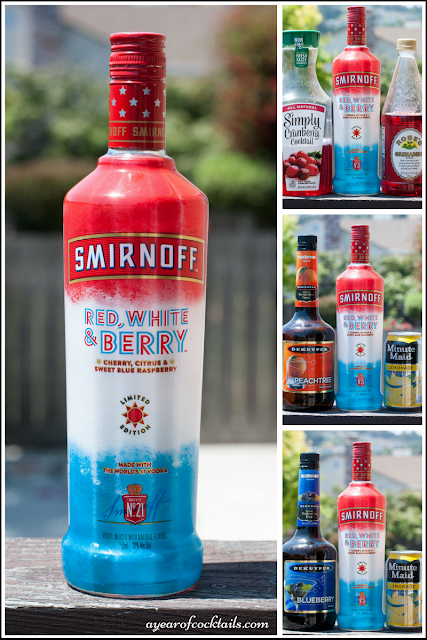 I was contacted and asked if I would like to have a bottle of Smirnoff's Red, White & Berry vodka to make some cocktails with. Um. Heck yes I would LOVE a bottle! Not only did they send me a bottle of vodka, they also sent me two bottles of their Red, White & Berry Smirnoff Ice! WIN!! Let's start with the vodka. When you open up that bottle does it ever smell DELICIOUS!!!! The berry aroma is great! I couldn't wait to create a cocktail with it. So.......I went a little overboard and.......well sort of created 3 cocktails in one. They had sent me some recipes that others had created and one of them was layered, so I knew I wanted to create my very own layered cocktail with this bottle. I wrote down what I thought would work and started blending each layer AS QUICKLY AS I POSSIBLE COULD! Yes, I totally could have stuck my glasses in the freezer between layers, but honestly I had all of my ingredients out and it really doesn't take much time to whip up the next layer so I decided to go for it. It worked...until it was time to take a million photos of these fantastic cocktails......on a warm day......out in the sun. Needless to say they started to melt a little, but that took NOTHING away from their taste or awesome layering! I have got to say this cocktail is REALLY good! I haven't had a sweet cocktail in quite some time and this one right here.......WOW! 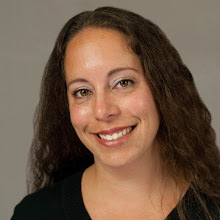 OK, maybe it's just me? Anyways, what are your plans for the weekend? Any holiday celebrations you are throwing or attending? We have a party this weekend which should be a great time! You can't beat family, friends, warm weather, food and of course cocktails!! 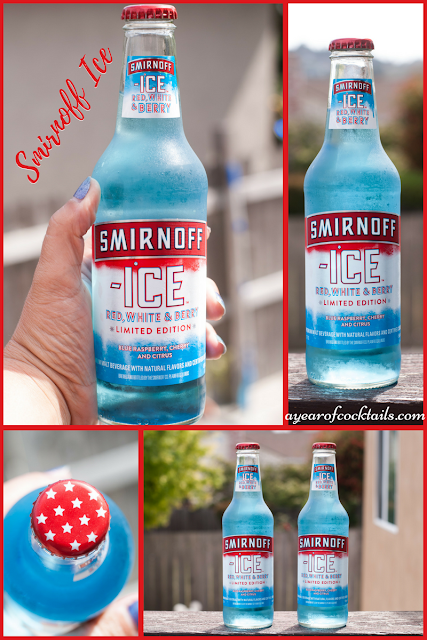 Now onto the Smirnoff Ice bottles they sent me! 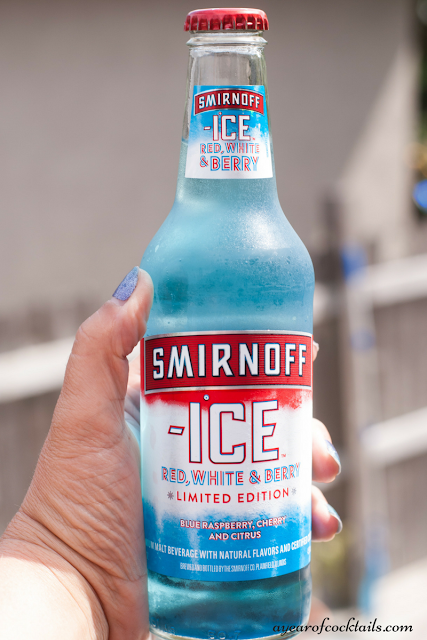 I will admit, it's been years since I've had a Smirnoff Ice. Actually the last time I had one, they only came in their original flavor. Gasp. I know. Horrible. So........these smell........delicious too! Oh that berry smell is great. FREAKING AMAZING! I need to see if I can find these at the store because these are absolutely necessary for this weekend! Absolutely! PLUS, they're blue! I mean what could be better? Did you notice their cap? Little stars!! How adorable is that? 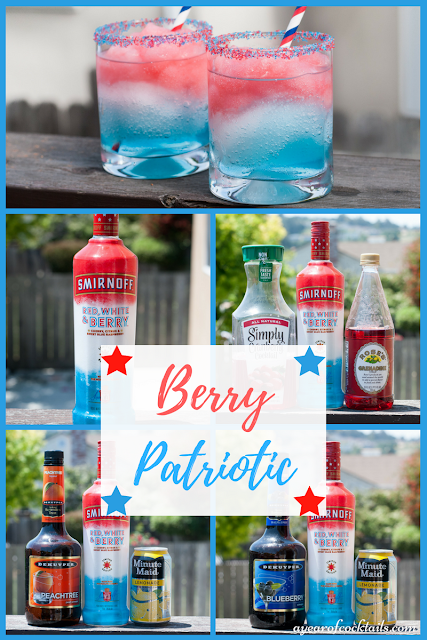 OK, so let's get you that 3 in 1 recipe for the Berry Patriotic! Blend ingredients for blue layer with ice until ice chunks are gone. Pour into the bottom of the glass. Blend ingredients for white layer with ice until ice chunks are gone. Layer on top of the blue layer. Blend ingredients for red layer with ice until ice chunks are gone. Layer on top of the white layer. There you have it! A fun looking layered cocktail for Memorial Day weekend! 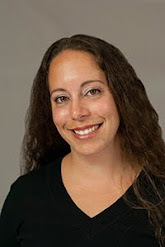 I hope you all have a fun and safe weekend! I love Smirnoff! I wanna try this drink!!! These look so refreshing and patriotic! I love layered drinks! I think they are so fun! 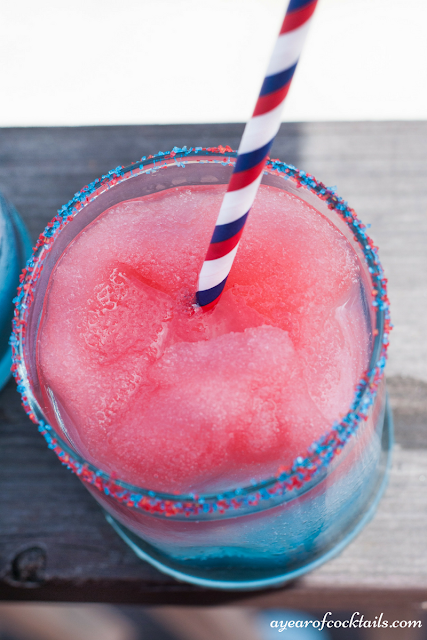 These are SO fun and festive for summer. Esp for this weekend! This looks so delicious and colorful! It's perfect to serve at all of the upcoming parties/BBQs! 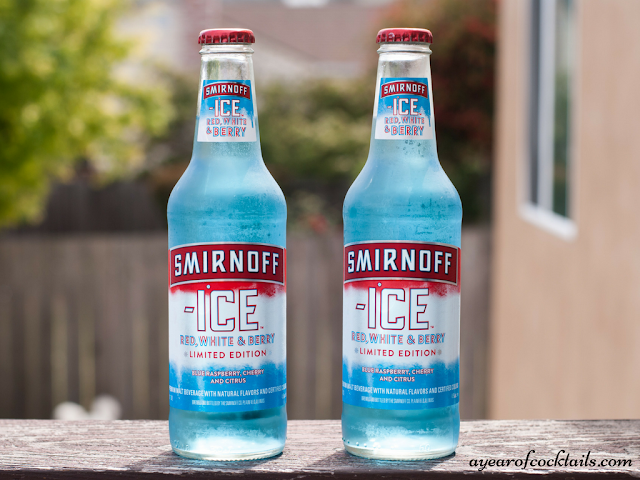 Smirnoff makes some nice drinks and I like how you made these great cocktails from this one. it looks pretty and I am sure it hits the spot too.